Micrographia: Videomicrography in the field: Page 1. Not so long ago, filming live organisms through the microscope on location would have required a car-boot full of expensive and fragile equipment including a microscope, movie or video camera with heavy-duty camera support, monitor, recorder, cables, batteries and sundry power supplies -- not to mention some kind of bench to support the assembled apparatus and at least one assistant. This effectively explains why the operation was rarely attempted. Samples were instead bought back to the lab where cumbersome and vibration-sensitive equipment was adequately protected from damage. In the last several years however, there has been much progress both in portable computing power and in the capabilities of digital cameras. It is now possible to perform imaging tasks in the field with miniature, battery-driven equipment, which would have in the past required the mains power supply and stable conditions of a laboratory setup. 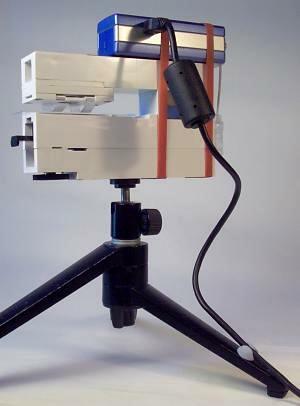 For example, owners of an Open University McArthur microscope or similar portable instrument can shoot still images or extended sequences of video at sufficient quality to satisfy the requirements of a website, or emailing to a colleague, using the battery operated equipment shown on the right, combined (or not) with a notebook computer running the Windows OS. The McArthur field microscope in its various incarnations must by now be familiar to many thousands of people, particularly students of the Open University, for whom the university produced their own version, and those who have acquired an OU unit in the recent sell-off of ex-OU instruments. The OU microscopes have a resolution somewhat less than that of the average laboratory microscope (whereas versions of the McArthur microscope by other makers are equal in performance), but were designed to be cheap, robust and sufficient to the task. Their resolution is however, well matched to the maximum resolving power (640 x 480 pixels) of the Aiptek digital camera shown above. Additionally, the low capability of the camera's CMOS pixel array in handling extreme contrast is one of the camera's limitations in normal use, but the high contrast implied by this performance is a distinct advantage in brightfield micrography, and in combination with the OU microscope, some surprisingly clear, sharp(ish) imagery is possible. 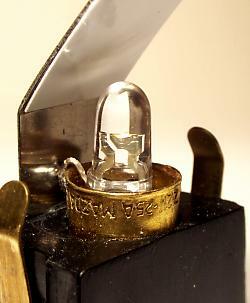 The picture shows a modification to the illumination of the OU microscope which is of great advantage in the present application, but not strictly necessary if the standard torch-bulb illumination is working well. It shows the filament lamp of the standard instrument replaced by a white-light LED. There are a number of advantages to this practice, and one caveat. 1. Greatly increased battery life. 2. Light of approximately daylight quality. 3. Much improved steadiness of light output. 4. Source permanence. LEDs last practically forever. With two AAA alkaline batteries supplying the current, the operating voltage is 3.0V, which is below the nominal voltage (3.6V) for the LED. This nonetheless produces light sufficiently bright for the job. The current required (30mA) is a fraction of that pulled by the filament lamp, and so poor electrical contacts, which can cause fluctuations in the light output of the filament lamp, have much less effect on the light from the LED. The improvement in battery life is such that if the LED is inadvertently left on, there is still enough intensity for videoing a full day later. And the caveat: Polarity must be observed in supplying power to the LED. Placing the batteries in the battery compartment the wrong way around may damage the LED -- at any rate, it won't light up. Trace the connection from the anode of the LED and ensure that this always connects to the positive battery terminal. The spec. sheet which comes with the LED will identify the anode. All the micrographs illustrating this article have been taken using an OU McArthur microscope with this modification, and using the setup shown above. The digital camera is by Aiptek, and retails for around US$60 as a combined webcam, videocam and still digital camera. There are many webcam-type cameras of similar point and shoot specification on the market, all producing low resolution images of variable quality, with no-frills camera and software controls. In this particular case however, a felicitous combination of physical construction and software capability make the Aiptek well suited to photomicrography. The physical attributes are the approximately flat front face of the camera, and the deep placement of the lens inside the camera body. The first feature guarantees that if the camera is laid flat upon the top surface of the OU microscope, its optical axis will be perpendicular to that surface, and thus can be made to coincide with the optical axis of the rays emerging from the eyepiece. The second feature places the camera lens at the right height above the eyepiece to receive the image from the microscope without vignetting. The software feature lies in the choice of whether or not the image is scaled to accommodate the full field, or cropped in from maximum resolution, offering a zoom of a kind which is particularly useful on the 352 x 288 pixel setting. This setting is effectively a crop centered on the 640 x 480 field, so that all objects imaged are at the maximum resolution of the camera, but in a reduced (352 x 288) field centred safely within the image of the eyepiece diaphragm (see next page). Software and drivers are available only for the Windows platform. The net result of the above is that still and moving images can be captured simply by placing the camera over the microscope eyepiece and pressing the button. Having said this, the placement of the camera over the eyepiece must be precise (accurate to 0.5mm), and just pressing the button limits the length of the video to the onboard memory of the camera (8MB), and compels the operator to shoot blind, since cameras in this price range have no LCD screens. Focus under these conditions is reasonably assured if the microscope is focused by an operator of normal vision. This will ensure focus in the camera, which is also set for infinity focus. "No frills" also means that white balance, exposure level and other subtleties cannot be set by the user and must be left to the automatic function of the camera -- which manages them remarkably well. Much more flexible is the arrangement of connecting the camera to a laptop computer by the supplied USB cable, enabling viewing of the image and control of the camera from the computer. This also gives choice over the resolution of the videoed image, and recording time is limited only by hard disk space available on the computer. Interfacing the camera to the microscope is described on the next page.